It's true, and Horimiya proves that with a strong main guy and girl who are nothing like those you find in romance manga. And I may say that about all the romance manga I have read so far, but this time I mean it. 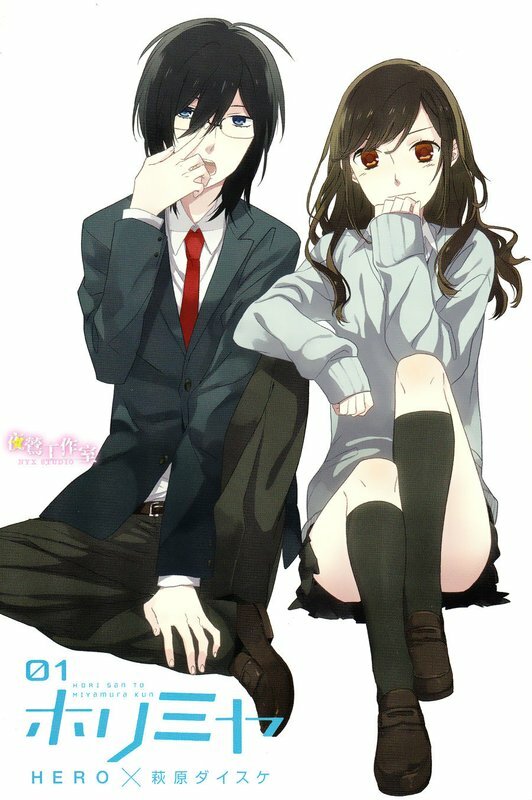 Hori Kyoko is popular, beautiful and smart, and Miyamura Izumi is the type no one wants to associate themselves with due to his appearance, and his grades aren't all that. This is them during school hours though. After school, Kyoko dresses down and looks somewhat like a simple housewife, and takes care of her little brother Souta since her parents are busy most of the time. Then there's Izumi, who ties his hair back, revealing his many ear piercings, takes off his glasses, and wears short sleeved tops which reveal his tattoos. Yes, he has tattoos! And they're not just on his arm; he also has some on one side of his body. See now what I mean by don't judge a book by its cover? Horimiya doesn't stop there with the twists either. There's romance and comedy as the two slowly get to know each other as the story progresses, delving deeper with Izumi slowly opening up and making friends with others. Kyoko and Izumi eventually fall in love and date, but the good thing is that the story doesn't rely upon their romance much to get things moving and make things interesting. There are some rare but adorable moments here and there, featuring other characters and their involvement in romance too, and you think that there'd be more of Izumi and Kyoko's, but the comedy part to their relationship is priceless. Never have I laughed so much reading a manga in my life (so far), because Izumi and Kyoko have other characteristics, which I will not reveal here, but trust me when I say the comedy is just top notch. So the story so far is based on Izumi and Kyoko's high school life as usual, with Izumi being exposed to new things now that he's able to see life from a new angle all thanks to Kyoko talking to him. More characters come and pretty much stay once they've made their appearance in the story, and their effect on Izumi and/or Kyoko is awesome, in the sense that when people try to get serious, the manga thinks "hey let's try to turn this into comedy gold"; it does not fail. People to watch out for are Kyoko's dad, Izumi's first "friend", and I guess Kyoko because of my reasons mentioned before. Horimiya is a School Life manga which takes a more comedic approach when it comes to the Slice of Life part of the story, with some rare moments of romance. It has a strong story which is not just main guy and girl focused as whoever comes into the story leaves their mark, no matter how small it or their part may be, affecting either Izumi or Kyoko, or those around them, with surprising results at some points (one stands out in particular!). The manga is still ongoing, but hopefully it continues on after high school. It's definitely reread material and highly recommended to everyone and not just those who want a romance manga but not focusing purely on romance. I will say that there are some good romance focused manga out there, but Horimiya is original and stands out because of it.